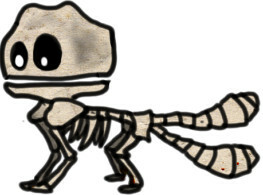 We are at Halloween again, so in the spirit of the season I will resurrect another corpse of a failed design and put it on display to scare the children! Above is one of the very first concept images for Backworlds – then Backworld – that Juha made when there was barely even a platform game there. We were still discussing just what having a frontworld and a backworld meant for gameplay and what the rules would be, and one of the ideas Juha had was to have broken circuits that you needed to complete by connecting pieces in different worlds. Much later, when we were coming up with the core mechanics for the themed worlds, we were struggling to find good ways to change the behavior of a world so I made the pitch to create a world that revolved around specific game objects instead – we called this world Circuit. 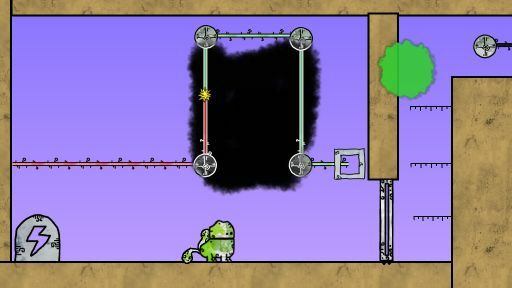 The basic concepts here were the the circuits connecting the circuit nodes and the sparks running along them – I got this system up and running quickly and figured out that it was really easy to come up with puzzle designs ranging from trivial to near-impossible. 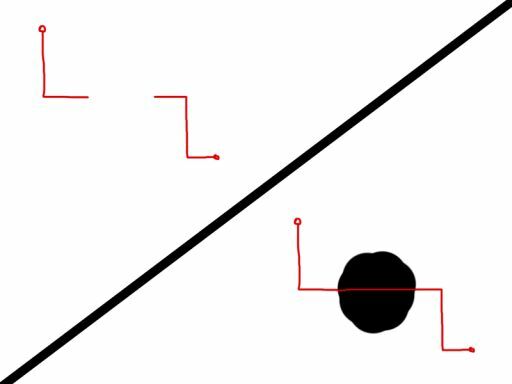 The puzzles essentially were about making sure that the spark was at the right place in the right time, and by adding more sparks and more paths that the player had to synchronize we could obfuscate the solution to the puzzle without adding red herrings. It was also really easy to build the levels and they very rarely had the edge case physics issues we had seen on the other levels. 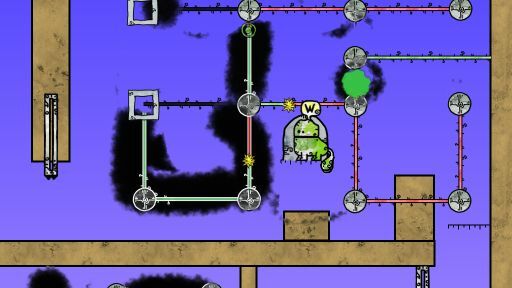 So in short, building Circuit was a lot of fun, and the designs of the pure puzzles felt very clean. Juha had reservations about the player avatar not being involved in the puzzles, but I went ahead and worked out the kinks in the circuit system, even added some preliminary production art to the circuits and made sure they played well with effects before building yet more Circuit levels. Juha still had complaints, but I liked the process of working with Circuit so much I kept working on them until we could get them playtested. The playtest did not go particularly well and on examining the place of Circuit in the larger design of Backworlds I finally grasped what Juha had been saying – the circuit puzzles were fundamentally a different kind of puzzle that you were solving with a really awkward interface. At its core, Circuit was about enabling and disabling circuit parts at given times, and making the player do this with the Backworlds paint mechanics and platforming only detracted from this. Again, the puzzle designs felt clean and might have worked in their own setting in a different game, but in Backworlds they were misplaced. In retrospect, I had confused something being easy and fun to work on with it being a good design, and had I made more of an effort to understand Juha’s initial reservations we would have saved a lot of time. That brings this Halloween post to a close, in development news we are still working on production art but also sorting out administration and plans for the final stretch of development. Nothing to announce just yet, but next year should be interesting! On a final note, the IGF entrants have been posted! Tough competition this year, I’m hoping my personal Game of the Year 2017 Hollow Knight gets recognition but I would also like to call out Amanita Design’s delightful Chuchel and, for the puzzle fans, Alan Hazelden’s intricate Cosmic Express.